Vosteran.com is a browser hijacker that changes the default homepage and search settings to “http://vosteran.com” in popular Web browsers, such as Internet Explorer, Google Chrome or Mozilla Firefox, without the user’s permission. In fact, Vosteran.com hijacker modifies the browser settings in order to perform browsing redirects into advertisements and earn money from their publishers. Vosteran.com hijacker is designed to modify your browser settings and may install additional plugins (toolbars, extensions or add-ons) in your Web browser in order to promote other links or products. Browser hijackers like this, may redirect the user's computer into malicious websites or may install malicious programs in order to compromise the user's computer to security risks. Technically “Vosteran.com ” is not a virus and is categorized as a malware program (“Potentially Unwanted Program (PUP)” that may contain and install malicious programs on your computer, like adware, toolbars or viruses. If a computer is infected with “Vosteran.com” hijacker, then more pop-up ads, banners and sponsored links are displayed on the victim’s computer screen or inside the Internet browser and in some cases the computer speed may be slowed down due to malicious programs running on the background. Step 1: Clean Vosteran.com with “AdwCleaner”. Step 2: Remove Vosteran.com entry from your Internet Browser Shortcut(s). 1. Right-click on your Internet browser icon and choose “Properties”. Notice*: You must perform the same operation for all Internet browser shortcuts, including those in your Programs list and taskbar. * Press “Continue” when asked to “Provide administrator permission to change these settings”. 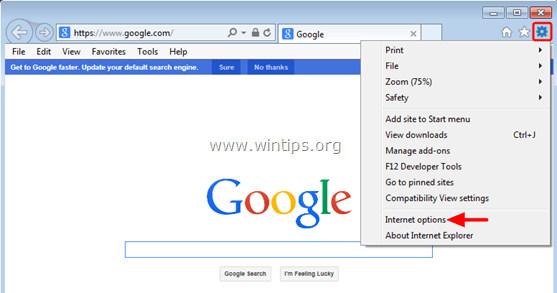 Step 3 – Remove 'Vosteran.com' search settings from Internet Explorer, Chrome & Firefox. To ensure that 'Vosteran.com' search settings are completely removed from your Internet browser, reset your Internet Browser Settings to their default values. Remove Vosteran.com search from Firefox. Step 4. Remove Vosteran.com with Junkware Removal Tool. Step 5. Remove Vosteran.com infection with Malwarebytes Anti-Malware Free. « How to Find Windows Product Key (Windows 10, 8, 7, Vista, XP)	» Remove Windows Manager Protect Potentially Unwanted Program.